Beautiful detailed 19th century French Louis XVI fireplace mantel. Executed in white Carrara marble from Italy. Great original condition, see detailed pictures. Ready to be shipped and installed. Great original condition, see detailed pictures. Ready to be shipped and installed. Very fine carved 19th century Louis XV mantelpiece from Paris. Beautiful decorative piece. Opening measurements: 34.6 x 42.1 inch. 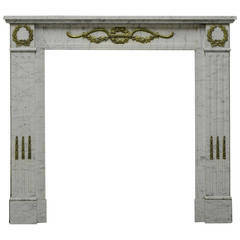 Exquisite antique Louis XVI from France, executed in beautiful escalette marble. Some old restoration, great patina. Ready to be shipped and installed. 19th century Louis XVI fireplace mantel. Opening measurements: 36.2 x 30.5 inch. 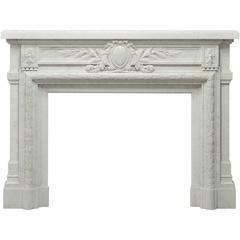 A fine white marble reproduction fireplace in Louis XVI style.